Well, maybe not. Hot on the heels of old LEGO part discoveries and tips on how to hurt your vintage LEGO, a quick look at how LEGO ages. What we have here, in the middle, is a part 4170, or Electric Train Light Prism 1×6 Holder, as Peeron calls it (together with two transparent light prisms). Appearing in red and black, this part was used in half a dozen sets released between the years 1980 and 1985 (there was also a “let’s empty the warehouses” parts pack, in black, in 1987). Since LEGO Trains was only replaced in 1991, it is possible the part was still manufactured and sold later in the 1980s, but at the very least this part is around 20-25 years old, maybe more. 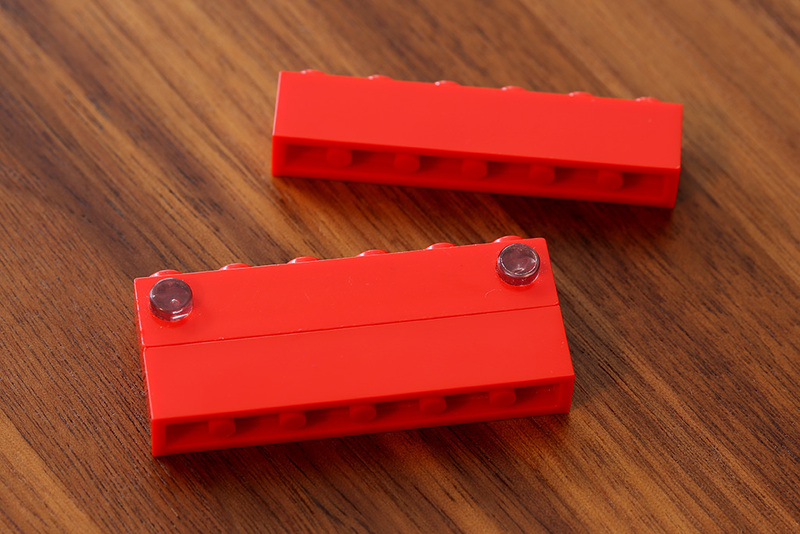 Next to the BrickLink acquired light prism holder are two, very regular red 1×6 bricks, one connected to the prism holder, the other not. These bricks have the same color, the same size, just without the prism cavity. Also, the two 1×6 bricks in the picture are separated by some “20-25 years… maybe more” from the light prism holder – they are brand new, never been used before. All these parts will be going into my re-created 7740 Inter-City Passenger Train. But how do they compare, looks and condition-wise? From the above angle, very well, the older part has become slightly lighter in shade, a nick here or there, but otherwise quite indistinguishable from the new parts. Reality is made clear, though, when light is reflected off the parts. 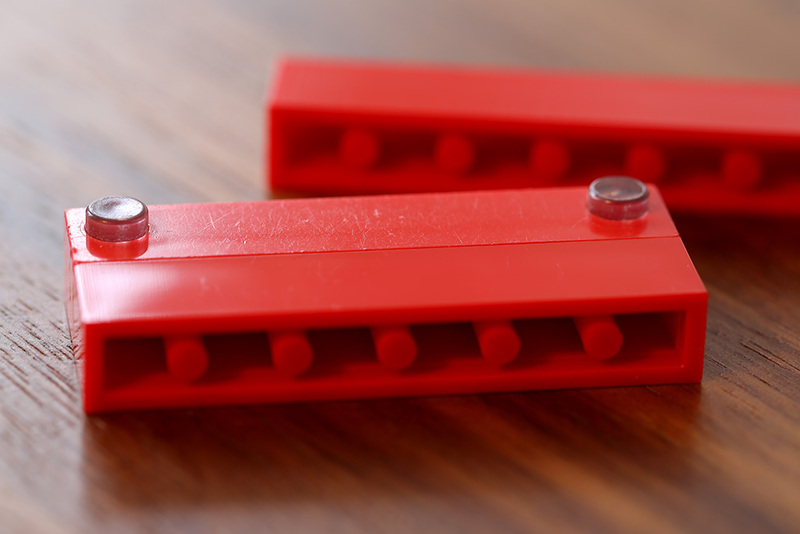 While this one and most other LEGO parts have inherent colors, so scratches remain the same color as rest of the part, older parts can often lose their gloss as the damage mounts over years. It almost looks like the older part has become a little matte next to the shiny new bricks, this of course is merely the result of decades of LEGO pieces brushing each other in close quarters. My experience with BrinkLink orders has varied, many are like this one, some better, some worse (the worst parts are the stained and “sun tanned” ones, which come across from time to time and may look particularly off in a design). I’d say from my limited experience over the past year and a half, this 1980s prism holder is in a fairly typical condition for its age. Expect something like this when BrickLinking. Of course, if the part has spent the decades attached to a built-up model, it will have fared better – some of my old childhood pieces are in excellent condition, while those that I’ve put together and taken apart many times look a lot more weathered. One of my ideas for the 7740 Inter-City Passenger Train project was to use as many new pieces as still manufactured by LEGO, together with used pieces where no modern version exists. As I calculated, around half of the parts in the train are still manufactured/sold by TLG. I did this out of interest (and to avoid cleaning LEGO), but I also worried whether it would result in a frankensteinian look that just wouldn’t match. We shall see what happens in the end.